This book was reviewed for The Englewood Review of Books and originally appeared on their site on June 19, 2012. Click here to view the original post. The heart of a mother beats strongly for her children. With every thump-thump, a mother desires to be and do the best she can with the precious gifts of life that God has placed under her care. The enormous responsibility of parenting elicits a range of emotional responses that tend to vacillate (sometimes daily). 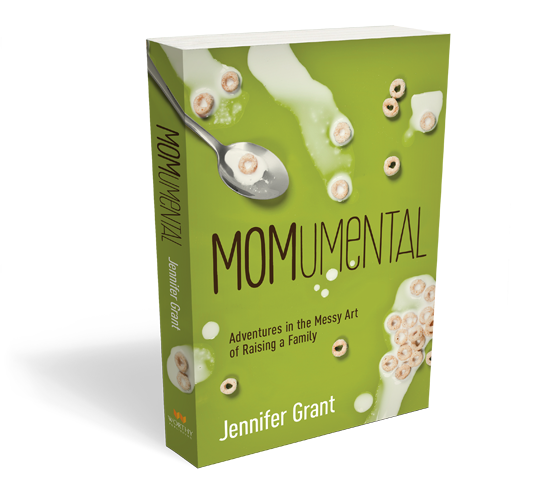 To encourage and aid the sanity of every mother, Jennifer Grant wrote MOMumental: Adventures in the Messy Art of Raising a Family (Brentwood,TN: Worthy Publishers, 2012). Ms. Grant’s own childhood and parenting experiences provide the impetus for the book. “A latchkey kid from a broken home” (p. 5), her ideas about marriage and family began developing early, mostly in opposition to what she lived. Unlike her parents’ turbulent marriage that eventually ended in divorce, hers would be loving, warm and solid. In contrast to the busy and grumbly parents for whom she babysat, Grant would be an attentive and creative mother who modeled “tolerance, good humor, and gentleness for [her] children” who in turn would “mirror these traits” (p. 9). She spent many years of her early motherhood searching for the “perfect mother”; and when Grant believed to have found just this in her neighbor, she sought to emulate the other woman’s every move. Time and life mellowed Grant, and eventually she “became real” (p.15). She acknowledges with confidence the impossibility of creating perfect homes and raising perfect children. Throughout the book she celebrates the humanity of each person in her family — the good, the not-so-good and all spots in between. Instead of the pursuit of perfection, Grant asserts that family life is both a treasure from God to cherish and an adventure. In each chapter of the book she shares how she has “come to appreciate the mess of it” (p. 18). MOMumental is an uplifting and enheartening read. Grant’s writing style is authentic and personable. The stories that she shares certainly teach moral and parenting lessons by example (both what to do and what not to do). But, they do so in a relatable way. The reader does not feel as if Grant is displaying her mothering superiority or shining a light upon her extraordinary children. On the contrary, her tone is warm and down-to-earth. Grant mentions her writing career in passing several times. When she does, she emphasizes her commitment to attending to her children while writing. This is a testimony to her parenting priorities and philosophy. However, it seemed that the book spoke primarily to either full-time stay-at-home mothers or at-home moms with part-time jobs. Considering the revolving debate whether women should work or stay at home after becoming mothers and that women are now almost half of the American workforce, it is surprising that Grant neglected to provide an “adventures in balancing work and home” chapter. Working Mother magazine reports employed moms feeling laden with mommy guilt, struggling to balance work and home life, and lamenting the lack of both quantity and quality time with their children and mates. MOMumental, unfortunately, does not speak to these scenarios for these moms. This leaves a significant part of motherhood for many women undiscussed. On the whole, MOMumental embodies and performs to readers the function of a mom’s group program at Grant’s church about which she speaks towards the end of the book (chapter 14). The purpose of the group is connecting newer moms with younger children and more experienced moms with older children. After years of saying yes way too many times, Grant was on a self-proclaimed church volunteering hiatus when her priest called to ask for her participation. When she wisely emphasized the minimal commitment in her pitch, Grant listened further to her priest. She liked the idea of women building friendships and providing support for one another in mothering. However, when it became clear that her role would be that of the “older”, more experienced mom, Grant had to swallow her surprise and pride (p. 225). The tables had turned. Now she was the one answering mothering questions instead of asking them. Graciously, Grant acquiesces. You’re doing great. And it gets easier. I promise.